The role has been vacant under President Donald Trump. AMERICA COULD SEND a special envoy to Northern Ireland in the future. The issue was discussed yesterday when Tánaiste and Foreign Affairs Minister Simon Coveney met US Secretary of State Rex Tillerson in Washington. Tillerson told reporters he was reviewing names for the position. The position has existed since 1995, when George Mitchell took up the position. It was vacant between 2011 and 2014, but President Barack Obama appointed former senator Gary Hart to take up the position. It has been vacant under President Donald Trump. 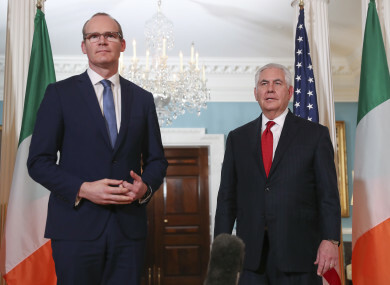 A statement from the Department of Foreign said Coveney and Tillerson had “discussed a range of issues, including the current impasse in Northern Ireland and the implications of Brexit”. The prospect of a future Northern Ireland envoy was also discussed, said Coveney. On Brexit, Coveney updated Tillerson on negotiations and pledged that Ireland would play an enhanced role in transatlantic relations. “I told the Secretary of State that Ireland faces the challenges of Brexit as a global island at the heart of Europe and as a country with a close partnership with the US. I also underlined our determination that Brexit must not in any way undermine the peace process and the gains achieved by the Good Friday Agreement. Email “The US could send a special envoy to Northern Ireland soon”. Feedback on “The US could send a special envoy to Northern Ireland soon”.